Such a lot to know! the manufacturer has cut corners? As shopkeepers, we need to be able to tell quality without the “clues” a consumer has: what store are you in? How much is that item? Is it full-price or has it been marked down several times? There’s a lot for us to know as we select and curate merchandise to offer you. 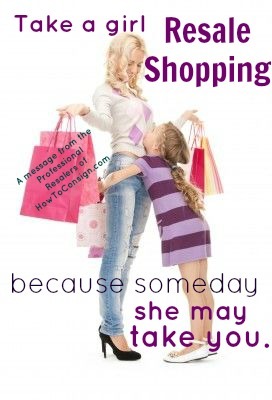 you are MORE assured of quality, value and wear-ability when you shop resale. Watch the news clip. And read the transcript on that page for even more info. 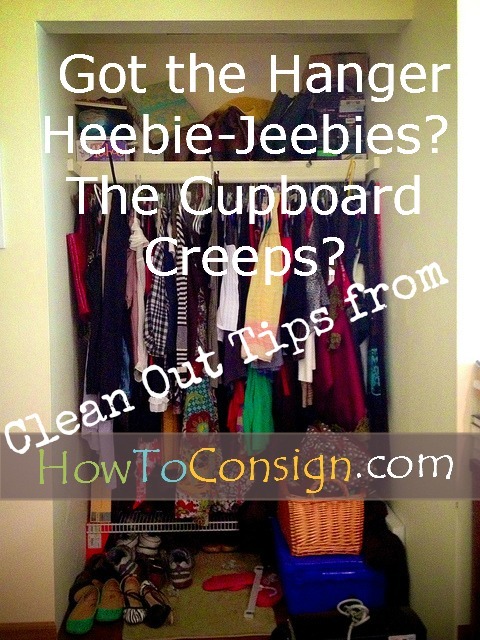 Got the Hanger Heebie-Jeebies? The Cupboard Creeps? Cleaning out, organizing, owning only what you love. They say it’s easy. They lie. Cleaning out your stuff, figuring out what to save and what to pass on, it’s hard. You’ll laugh, you’ll cry, you might even cuss a bit under your breath. If you are in need of closet clarity, read on. FIRST: WHAT REALLY ENHANCES YOUR LIFE? The easiest possessions to get rid of are those you don’t use. You know what these are: the ottoman you constantly trip over, the dress that was perfect for last year’s cruise but when do you ever go dancing at home, the toys Uncle Bob thought would be perfect but which your kids disdain. Okay, those things are piled up to get rid of. Next, tackle the things you ought to use, but don’t. The heavy-duty pastry mixer (who has time to bake?) and the barbells. And the things that were once useful but now are gathering dust. The stroller (Jaime is so not into sitting still) and the best-selling books and DVDs you’ll never look at again. Get rid of them before they become outdated. The absolutely, no-holds-barred hardest stuff to get rid of? Your favorite… mistakes. Doesn’t matter how costly they were, those Jimmy Choo’s (that pinch your toes) or that cashmere baby blanket (does Aunt Maude have no sense whatsoever? ): if it is not an asset to your life as you live it now, pass it on! Not everything you’ve just decided to part with is worth consigning or selling to a buy-outright shop. Some aren’t “even” worth donating to a charitable thrift shop. The best quality, condition, and style clothing should be freshly-washed and pressed and hung neatly. If you’re sorting out decor items, check them for all parts, and make sure they are free of chips, scratches, and tarnish. 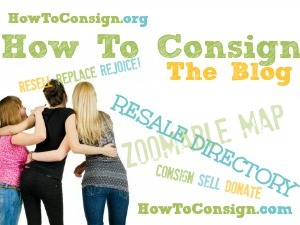 These are the items you’ll be taking to your friendly local consignment or resale shop. See Would you Wrap this in a Festive Bow? for more info. The next level down, perfectly good and clean items that are no longer in style but useful, will go in your “Donate” pile for the charitable shop of your choice. The final level, terribly worn, non-working, or soiled-for-good items should be thrown away or put in a “free” box at your next garage sale. Do not burden a charitable shop with the job of throwing away things you know are no longer useable…all you will be doing is adding to their costs of operating the thrift shop. NOW, CHOOSE THE SHOP YOU WILL USE. ACTUALLY, CHOOSE SEVERAL. 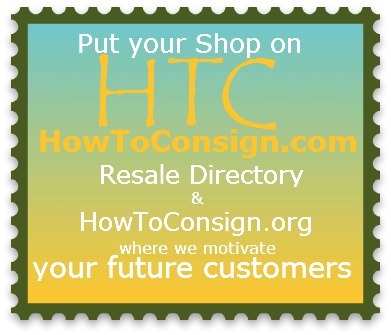 Selecting a shop or two to take your underloved items to is not a task to be undertaken lightly. 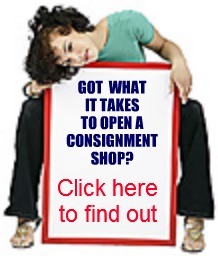 We discuss what you should look for in a consignment or resale shop here. Messy closet photo courtesy of apple_pathways on flickr.com. Warm weather, here you come! If you’re lucky enough to be due a spell of sun and fun on a cruise or at a tropical resort, you’re doubly lucky! You can shop consignment, resale and thrift for some nifty things to take along, and save enough for that special excursion. Parasailing anyone?